This is wooden chess board that designed for big chess pieces size. Automatically, the squares are adjusted with the chess pieces, so the squares are rather wide than ordinary chess board. Black and white wooden chess board is hard and thick. The board has made of Teak wood and polished well in black and white. Because of its size, it may suitable for outdoor use. This board should need rather large area. 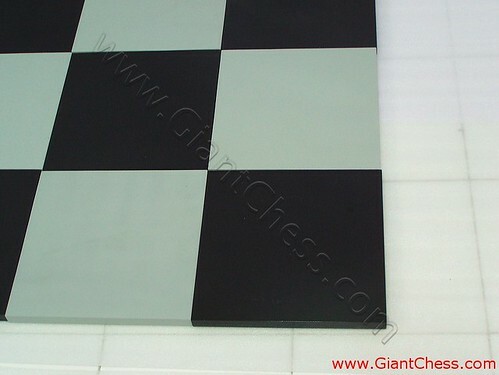 A chess board is square and flat, consisting of 64 squares, 32 black squares and 32 white squares. As this board, even its quite large, but it has 32 squares also. So if you want to use it for chess game, you can do it. You just need the chess pieces and put it on the board. This wooden chess board is best used for outdoor chess game.